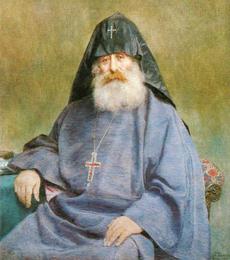 Ordained as a bishop in Etchmiadzin (1868), Khrimian was elected Armenian Patriarch of Constantinople in September 1869. He cleared the patriarchate’s debt and sought to increase the provincial representation in the Armenian National Assembly. He presented a detailed report to the Ottoman government documenting instances of oppression, persecution, and miscarriage of justice in the Armenian provinces. He used the position to advance the interests and conditions of Armenians in the provinces. His outspokenness annoyed not only the Ottoman authorities, but some of the Armenian wealthy elite as well. The government compelled him to resign in 1873. Afterwards, Khrimian dedicated his time to literary pursuits until 1878 (he published four books from 1876-1878), when he led the Armenian delegation at the Congress of Berlin. The delegation’s memorandum to the great powers concerning the implementation of reforms in the Armenian provinces was dismissed, and the Treaty of Berlin, signed in July 1878, failed to force the Ottoman government to implement real reforms.